We've been extremely busy this summer and early fall...mostly working on building our fence and doing our own landscaping. It's been a year, at least, in the planning stages...deliberating on where to place the fence, what kind to build, and what plants would thrive in our yard and make it most user-friendly. 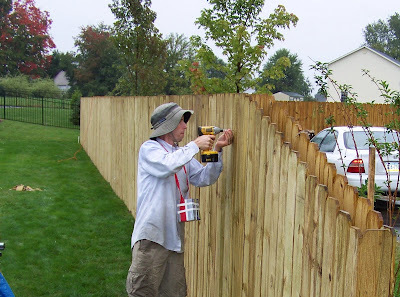 The fence has come to mean many things to us...safety for our children, privacy for our home, beauty, protection...and most of all, until it is completed at least, it has meant long hours of back-breaking work. Steve has worked tirelessly on the project. He comes home from his day job and does nothing else, but work on the fence until long past sundown. He works at least 12-hour days on Saturdays. And no working on Sundays, of course. We have really come to love Sundays! And our children have worked along side us during this whole thing. Guy digs and hauls wood, and Scarlett and Guy both have helped drill in screws. It has taken blood, sweat, and a few tears, but we are thankful for this project, as much as we can't wait for it to be finished, because it has strengthened our family and brought us together and taught us many valuable lessons--patience, teamwork, integrity, sacrifice, humility, and the value of work. The fruits of your labors will soon be harvested. I truly love Steve's hat...looks very glamorous. 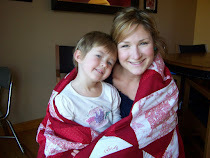 And, regarding preschool - I almost didn't send P this year. I am still thinking that if she really doesn't want to go or gets really upset about it I'll take her out. I don't want to push it since she is only 3, ya know?